The Three Magi charted the course of the Jesus' Star of Bethlehem by astrology. Then they followed the physical star, the causal body of Jesus, that could be visibly seen over the place where he was born. Herod was also aware of the astrological portents as powers of Evil read astrological cycles as signs of the times and use it against the people. The mass consciousness outpictures it almost to the letter. Astrology—done well—is a very accurate means of plotting the cycles of returning karma according to the cycles of the planets. Roger Bacon (c.1214-1294), one of the greatest minds of the thirteenth century. His pioneering in the realm of experimental science has won him the title Doctor Mirabilis (Teacher of Wonders). Bacon was an embodiment of the ascended master Saint Germain. We see the foreshadowing of his later life as Francis Bacon, writer of the Shakespearean plays, as many of Roger Bacon's works were written in a secret cipher. He was at odds with the powers that be due to his lively critique of theologians and scholars of the day as well as his credulity in matters of alchemy and astrology. Bacon believed that it was possible to avoid wars through the study of astrology. He said that if Church leaders had read the astrological warnings they might have averted the wars of their times. Astrology, therefore prophecy, predicts returning karma. But prophecy can be altered, mitigated or entirely turned back at any time before the ‘mist' becomes the ‘crystal'—before the energy of karma is precipitated in the physical plane. The Powers of Light and Good use astrology to teach people how to ride the light and defeat “the fates.” Enter Saint Germain, the Hierarch of the Aquarian Age. 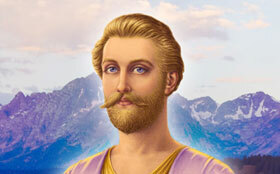 The violet flame is God's gift to us under the sponsorship of this beloved ascended master. Early in the last century, Saint Germain assessed the conditions on Earth and saw a great need for mitigation before the end of the Piscean Age. Saint Germain sought and was granted a dispensation from the Karmic Board to release the teachings of the violet flame to transmute the karma of the outgoing Piscean Age. The violet fire is the all-consuming fire of God’s light. It is the Seventh Ray aspect of the Holy Spirit. The violet flame works in microcosmic and macrocosmic worlds, from the smallest particle of matter to molecule to mind to materialization in man and mundane circles. When we invoke the violet flame, the energy invested in miscreation is demagnetized, or stripped, of its negative vibration. 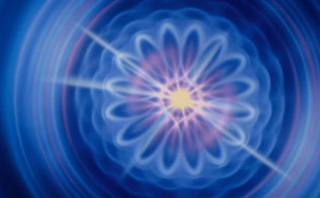 The energy is then recharged with the positive polarity of Spirit, transformed and restored to its original perfection and Alpha-Omega (yang-yin) balance. This means that negative karma—cause, effect, record and memory—can literally be erased by the cosmic eraser, the violet transmuting flame. The violet flame is the key to world transmutation. You may think that this is impossible, but “with God all things are possible.” God gave us a portion of his fire—fire for fire—when he gave us the divine spark, which is the threefold flame that burns on the altar of our hearts as shown on the Chart of Your Divine Self. Because we have this divine spark, we are co-creators with God. In the name of our Mighty I AM Presence and Holy Christ Self we can direct the violet flame into personal, national and international problems. 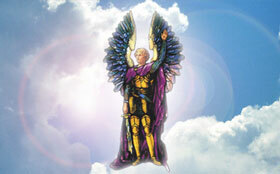 The powers, activities and legions of Light who serve the violet flame can then move into action. When directed, the ascended masters, Elohim, angels and elementals will transmute the out-of-alignment conditions that are the result of mankind's misapplication of the universal laws of God's harmony. If we saturate the earth and ourselves with the violet fire and the violet light, we can avert personal and planetary disaster. The key to effective transmutation is illustrated in Shakespeare's “slip twixt the cup and the lip.” There is a cycle between the initiation of a spiral of energy and its full-blown manifestation in the physical plane. In that span between octaves, there is opportunity for positive change. 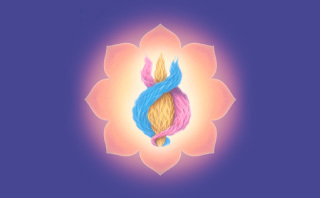 We need to use the violet flame to transmute that wave of returning karma before it “breaks” on the shore of our physical hearth and home—before it precipitates from the astral to the physical plane. When we know our astrology and use the universal solvent, the violet flame, we can overcome the darkness and manifest the Light—for ourselves, for our loved ones, for our Earth.